When you create an Apple ID, you automatically get access to "iCloud", which is the company's set of cloud services. iCloud is what keeps your contacts synchronized across your iOS devices and desktops / laptops running Mac OS X, updates your calendar, remembers your position and notes in iBooks, etc. A most useful service is the ability to remotely locate your iOS device or MacBook / Air / Pro. That's known as Find my iPhone or Find My Mac. Note: Apple can "push" notifications to devices with a cellular radio (3G / 4G / LTE), and poll their current location. So, the "Find my iPhone" and "Find my iPad" service (for iPads with a cellular connection), will always work, as long as the device is turned on, and as long as it hasn't been wiped or registered to a different Apple ID. For Macs and iPods, "Find my Mac" / "Find my iPod touch" will only show the location registered when that device was last online. To make sure that "Find my iPhone / iPad / iPod touch" is enabled on your iOS device, tap on Settings on your home screen (the gear icon). From the settings' root page (the first one), scroll down and tap on the iCloud submenu. On the next screen, scroll down until you see Find my iPhone (or Find my iPad / iPod touch). You'll see the word On if the service is already enabled on this iOS device. 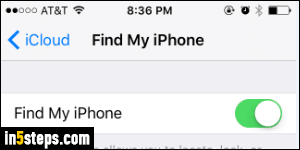 Tap on that menu to view more options: tap on the first option's toggle switch to enable or disable Find my iPhone. The "Send Last Location" option, disabled by default, will send the device's exact coordinates just before its battery dies (forced shutdown). Awesome if you lost it or had it stolen! Bonus Tip: you don't need access to any of your Apple devices, or even a Mac computer, to be able locate your phone or tablet. 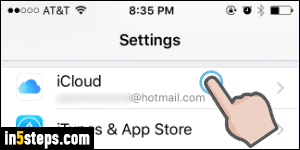 Just go to iCloud.com in any modern web browser, and sign in using your Apple ID and password. When the start screen loads, click on "Find my iPhone" (it says that even if you have other devices). If you didn't have to login to access iCloud, you'll have to login to access the device locator: then, zoom in to view all your devices. Select one of them, click on the "i" button, and click Play Sound (for example).